What a fun Saturday!! 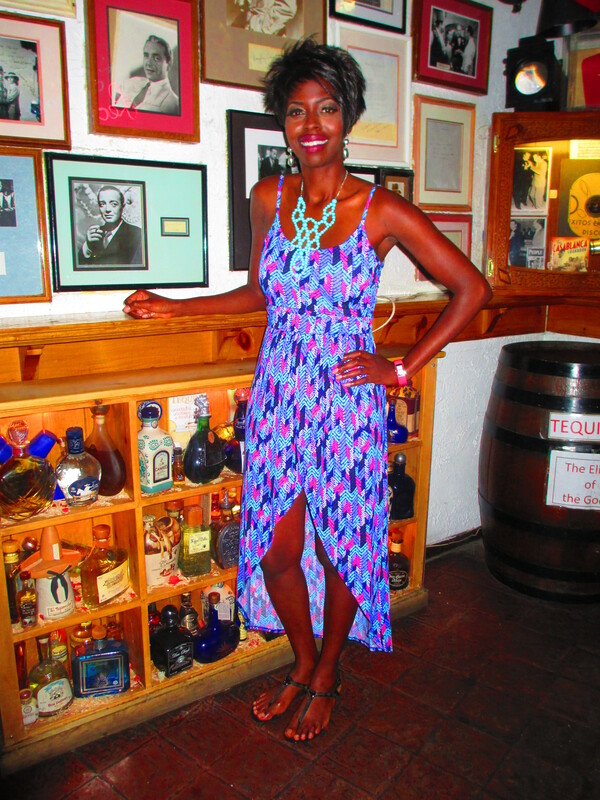 This look was worn to the LA Women’s Expo downtown at the LA Mart on 5-17-14 and to dinner at Casablanca. When I look at this I think of candy and bubblegum. Ssh-oes: Can You Hear Me Now? Wearing heels are always fun and fabulous. But do you want to hear the click-clack sound of them all the time as you are walking? I didn’t think it was possible not to until I was introduced to Ssh-oes. They have created “quiet” heels which eliminate that sound and give you comfort at the same time! Ssh-oes is the only company in the world that makes quiet heels. The ssh-oes have a non-slip, sound absorbing rubber outsole and a patent pending noise reducing heel lift, so they do not make as much noise when you walk. They are cushioned with memory foam and have a lycra and leather lining to make the shoe as blister free as possible. London Ssh-oes – The studs make this edgy and fun! I had the opportunity to select a pair of Ssh-oes and try them out for size. There are a variety of styles and colors, but when it comes to heels I want to be able to wear them with many outfits. I opted for the London shoe in black because the silver studs give it some edge, you can never have enough black heels and I don’t have a shoe like it in my collection. I was glad they had a size 10 in stock because normally I’ll find a hot shoe but my size isn’t available. When it arrived at my house I had the perfect outfit to wear them with and I couldn’t wait to take them out for a spin and quietly strut my stuff around town. 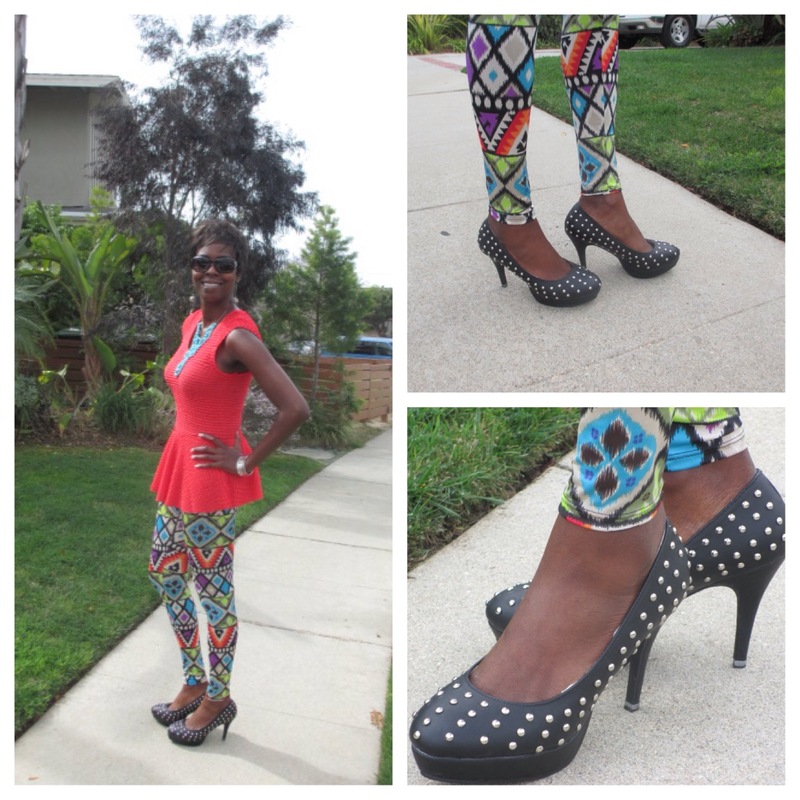 I decided to wear them with my print leggings and pepulm top since it was a nice balance of hard and soft. When I first put them on I thought I might need a bigger size since my feet are long and narrow (Size 10 is the largest size). With a little pull and tug at the toe tip are of the heel, I was able to fit my feet in with ease and not feel restricted. I headed of to my event and as I walked on the concrete in the parking garage with my friend I ask her to listen to my shoes – she noticed there was a sound missing and I told her how the Ssh-oes work.